There is no shortage of 1920s and 30s-era homes full of character in Dallas, especially in the Hollywood Heights neighborhood. The 1920s Tudor cottages in this area make Hollywood Heights a unique neighborhood to which Dallasites are flocking. One thing, however, that these character-infused designs generally lack is the modern conveniences – especially in regards to the kitchen space. This was the case with one of our latest Hollywood Heights Projects. When our clients bought a gorgeous Tudor home they loved the details and craftsmanship of the build and exterior aesthetic, but the majority of the interior space left much to be desired. The original kitchen was inefficient and had quite a small footprint. 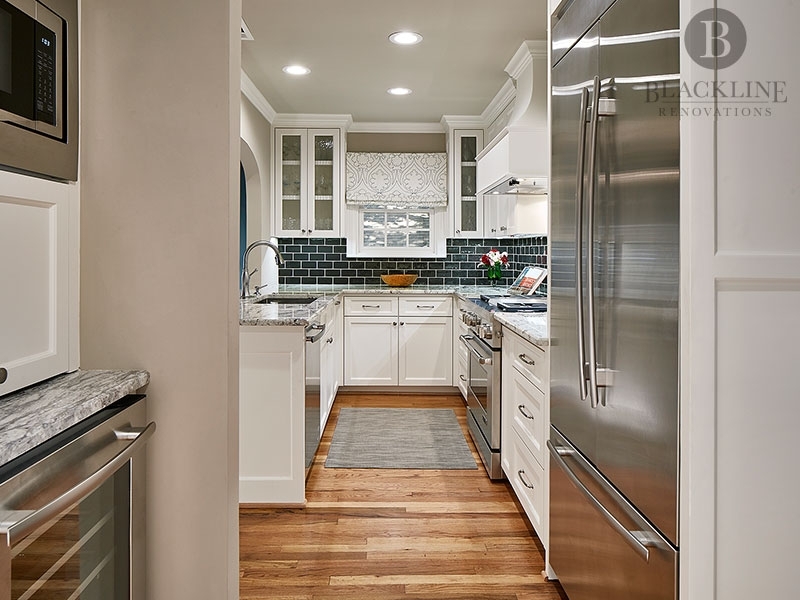 With outdated cabinets and very little space to cook or entertain, our clients knew they needed to renovate. The challenge of the renovation was being able to create a more modern look that would be cohesive with the distinct Tudor style of the home. Along with the team at J. Wiley Designs, Blackline put together a plan to not only ensure the clients would be able to enjoy all the modern conveniences of a newer home, but also avoid the cookie-cutter aesthetic that most remodels tend to gravitate towards. 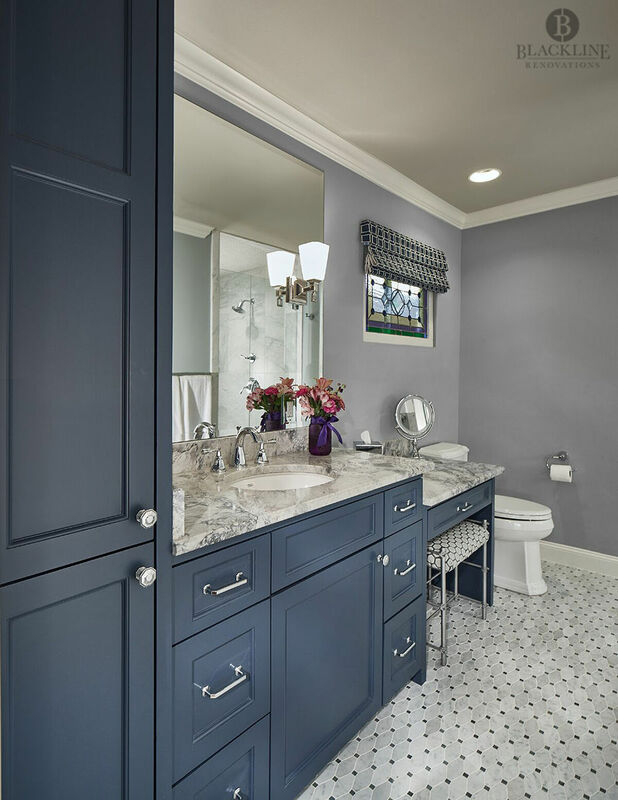 The design incorporated the clean, timeless look of White River Granite and Shaker Style custom cabinets from Douglas Custom Cabinets and incorporated cabinet pulls from Atlas Hardware that best reflected the Tudor Style of the home. 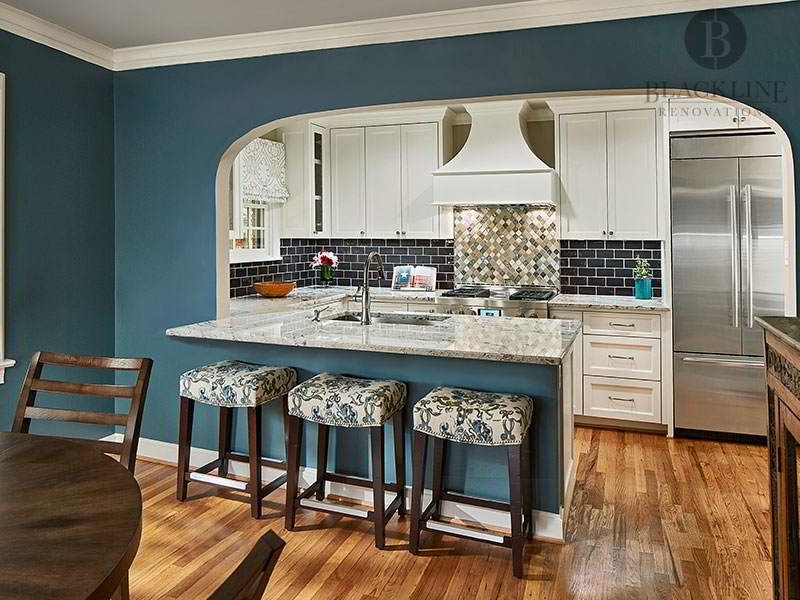 Blackline also ensured that original elements of the home like the stained glass window in the kitchen were salvaged, reinstalled and showcased. Blackline Renovations reconfigured the space and completely tore the kitchen structure down to the studs. From there, they relocated the entry of the kitchen to create a better flow from the living room – ideal for entertaining. By integrating a U shape design with a new peninsula overlooking the living room, the family is able to have an ideal workspace all while enjoying the open space of the living room. The homeowners love their new lighter, brighter home. They feel like they have the best of both worlds- a true architectural gem in the middle or the city with a modern, updated kitchen perfect for entertaining. Want to know more about the homeowner’s Blackline Renovations experience? Watch our homeowner, Haley Dugas, share what it was like to live in the house during a complete kitchen and bathroom remodel.